From a homeowner with a small fuel oil tank to a Fortune 500 Company with multiple campuses, American Petroleum Equipment & Construction Company, Inc. (APECCO) installs, inspects and removes the full range of petroleum storage tanks. We proudly provide a selection of tanks that, upon installation, are guaranteed by warranty. 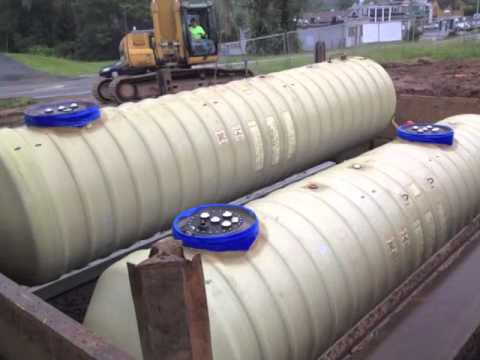 An Underground Storage Tank (UST) is defined as a tank and any underground piping connected to the tank that has at least 90 percent of its combined volume underground. An aboveground storage tank (AST) is defined as any storage tank that is aboveground, regardless of whether it is utilized to store petroleum products, hazardous waste, or other hazardous material. Commonly called CNG, these tanks house methane stored at high pressure, typically used in place of petroleum, diesel fuel or propane. Many customers prefer CNG because its combustion produces fewer undesirable gases than other traditional fuels. An Oil/Water Separator (OWS) is equipment to separate oil and water mixtures into their separate components. They are most commonly used to separate oil from oily waste water (such as bilge water) before the waste water is discharged into the environment.